The late Conseula Francis (1973–2016), the former director of the African American Studies Program, was deeply committed to mentoring and supporting junior faculty, and one of the many ways in which she championed the work of junior scholars in the field of African American Studies was to establish the Emerging Scholar Lecture Series. 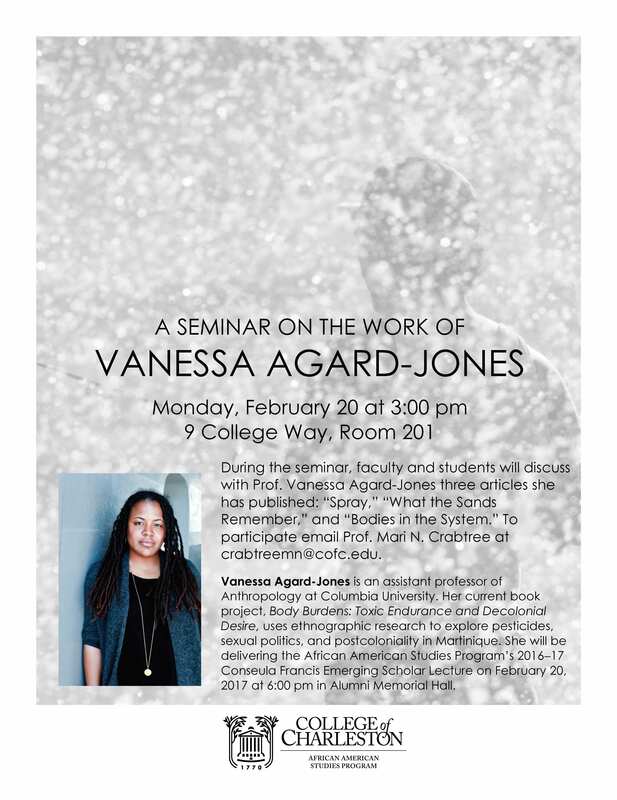 We still feel the loss of Conseula every day, and to commemorate her unflagging commitment to our program and to the work of junior scholars, we have named this lecture series in her memory. 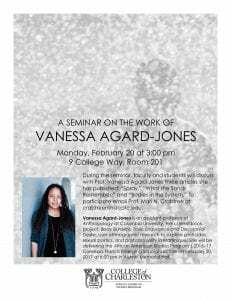 This year, Vanessa Agard-Jones, an assistant professor of Anthropology at Columbia University, will deliver the Conseula Francis Emerging Scholar Lecture on February 20, 2017. Her current book project, Body Burdens: Toxic Endurance and Decolonial Desire in the French Atlantic, uses ethnographic research to explore pesticides, sexual politics, and postcoloniality in Martinique. She analyzes the physical toll of toxins on the body as well as the metaphorical toxicity of colonialism in a post-colonial political context. Her other publications include Transnational Blackness: Navigating the Global Color Line (2008) co-edited with Manning Marable and articles in Small Axe: A Caribbean Journal of Criticism, GLQ: A Journal of Gay and Lesbian Studies, the Caribbean Review of Gender Studies, and the New West Indian Guide, among others. Prof. Agard-Jones’s lecture is titled “‘After the End of the World:’ A Black Feminist Analytic for the Anthropocene” and will be held at 6:00 pm in Alumni Memorial Hall (Randolph Hall). 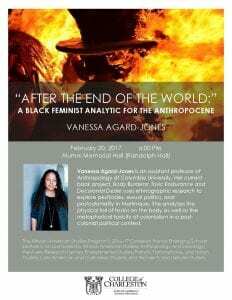 Please join us for her lecture as well as a seminar discussion of her work at 3:00 pm in 9 College Way, Room 201.